Another Monday morning at the charts. I’m coming to you today from St Andrews – I feel even more Scottish than normal. 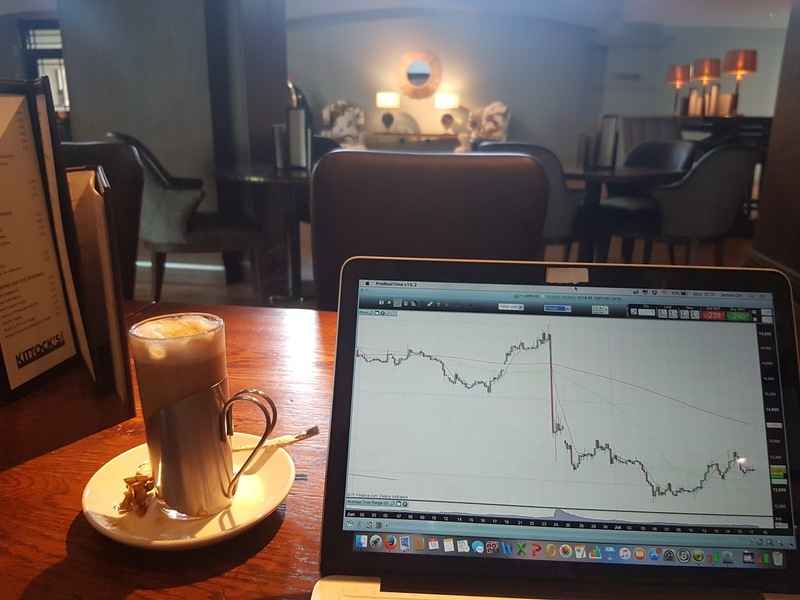 I’m working from the hotel bar with a latte in hand – I could certainly get used to this. I have had a lot of emails since the referendum result asking for clarification or simply my opinion on the matter and the reactions of markets. I always point out that the market had priced in a ‘remain’ vote and the subsequent shock saw investors dive for cover and pull funds as quickly as possible. What does that mean? Well, it means that for the most part, markets are somewhat predictable, because they repeat patterns and are, essentially, a big map of what people are doing with their money. So let’s go back to market reactions after the Brexit vote. GBP plummeted, the world ended, Donald Trump’s hair was proven to be his own… Ok, one of those is true at least. The GBP did fall very strongly, seeing levels against the dollar last visited before I was born. But was it unexpected? Sure, the reaction was very fast and very strong. But did it reverse the GBP trend and what we were looking at on the charts? The GBP has been in a downtrend for quite some time now. It has been displaying nothing but weakness. It has been riding under the MA200. It produced a rising wedge that brought on a sell, retest of the triangle and then further downside – this is all very negative and I would say anyone going long in that market with long term positions had to have been mad – or, more likely looking to make ‘fast cash’ off of the referendum. What I’m going to start doing is evaluating a Forex pair or Index every couple of weeks on Daily and 4 hour timeframes so you can start to see how I read the charts and what they are telling me. I will start with the GBPUSD and go over all of the things I have explained. Jump onto the charts yourself and see if you can find that ascending triangle and spot the break and retest before I show it to you. The sell was much more powerful than normal, sure, but the weakness was already there. It almost always is – On the day of the ‘flash crash’ the US markets were already very weak. Before the market crash in 1929? Our friend the triangle. Now of course there are those completely unpredictable events that can influence markets - think terrorist attacks - however as traders it is our job to protect ourselves as much as possible from everything that we can. For me that means have a solid trading plan, stick to that plan, control your risk and of course, avoid the news like the plague. But I guess you all want to know the one time markets went into what I term ‘chaos mode’? Well, have a look at a CHF pair on the daily timeframe. It’s impossible to miss. It happened when rates were unexpectedly cut... So unavoidable, right? Countless traders were wiped out and there’s nothing they could have done, correct? No! Avoid trading around large news events. We are here as traders, not gamblers, and believe me, there is a huge difference. Great post. Can i ask why the lense is covered on your mac? Iv been thinking the same for privacy reasons and now im more paranoid lol. I watched a show years ago that showed how easily the cameras can be hacked and switched on. Ever since then mine has been covered. only just checked the CHF pair you talk about above. Your refering to the 38 point spike up on the daily? The 14th of January. I think it was around 2500 points.